Professor of Sociology at Vytautas Magnus University, in Lithuania has changed during the counter-reformation, the First Republic after WWI, the Soviet Union, and finally after the Second Independence. According to Dr. Alisauskiene, the Roman Catholic Church heavily dominated pre-Soviet Union Lithuania. Clergy and members of the Church were heavily involved in the politics of the country, often acting as officers of the state. Acting as agents in the public and political sphere, the clergy would make decisions on behalf of all religions, including the small minority of Jehovah’s Witnesses, the Orthodox Church, Baptists, Muslims, Old Believers, and other groups, within the state. As sociologists of religion, we know that religion is embedded within culture and with the dominance of Roman Catholicism in Lithuania; it no doubt has influenced the cultural identity of the country. During Soviet control, there was forced secularization and withdrawal of religion from the public sphere. However, the people of Lithuania were very much still connected to their religion, and often practiced their faith underground. Dr. Alisauskiene points out that the religious institutions at the time lost their property, and the religious clergy experienced destruction of their system of education and were highly persecuted and imprisoned. Religious minorities were able to live their religious lives a little easier during the Soviet Union, but many still retreated to the underground community to practice their faith. Following the collapse of the Soviet Union, Lithuania regained independence allowing Roman Catholicism to regain influence in the society. The number of people that identified as Roman Catholic pre-Soviet Union and post-Soviet Union remained about the same. The Church once again established a working relationship with the state. The new constitution acknowledges the “traditional” religious communities, and the state enumerates what is considered “traditional”. With the resurgence of Roman Catholicism in Lithuania, Dr. Alisauskiene poses the question: “what does it mean to be Roman Catholic?” For Lithuanian Roman Catholics, much of that answer lies in the historical embeddedness of Roman Catholicism even under the oppression of the Soviet Union. As Alisauskiene states, after the fall of the Soviet Union, many of the countries took on a role of pluralism. However in the case of Lithuania, we see the citizens almost promoting a homogeneous set of beliefs and culture. This even comes from those in religious minorities. Instead of expressing a need for pluralism and to be recognized for the differences that their religion brings to the country, religious minorities push for the security of agreeing with the majority. This also creates an overall sense of security for the country. Alisauskiene attributes this to the proximity of Lithuania to Russia in comparison with countries like Poland. Interviewer, David G. Robertson poses the question of current-day migration issues in Lithuania. With the strong stance on homogeneous cultural identity, Alisauskiene states that Lithuania is not a strong proponent of immigration and have resettled very few refugees in the current European refugee crisis. One of the more interesting parts of this podcast is the discussion of Roman Catholicism under Soviet rule. As mentioned previously, religious institutions, particularly the Roman Catholic Church, lost land, buildings, and ways to educate their future clergy. As a way to show the oppression and spread the word about the treatment of the Church under Soviet control, priests and other clergy developed the Chronicle of the Catholic Church in Lithuania. As was customary before the advent of social media and 24-hour news cycles, the popular means of disseminating materials and political propaganda was in the form of pamphlets and materials to be circulated among the masses. In order to show the political oppression of the Roman Catholic Church, their resilience and resistance, the clergy produced the Chronicle of the Catholic Church in Lithuania in March 1972 (Dauknys 1985). According to Rev. Pranas Dauknys in his 1985 article, “The Resistance of the Catholic Church in Lithuania Against Religious Persecution,” The Chronicle emerged out of the unanswered petitions to the Soviet government to stop the persecution of religion under Soviet control. In December of 1971, 17,054 Catholics signed a memorandum to the United Nation General Secretary outlining the religious persecution that was faced by the Lithuanian people (Dauknys 1985). The Chronicle was a series of publication that consisted of statements from Catholic practitioners and clergy of the court proceedings against members of the Church and documentation of the protests against religious discrimination. The Chronicle of the Catholic Church in Lithuania remained in publication from spring 1972 until the 39th issue was released in the summer of 1979. The entire series of publications can be viewed online, here. Despite the oppression religion faced during Soviet control, Roman Catholicism remained an integral part of Lithuanian society. Believers and clergy proved to be an unstoppable force against religious persecution. 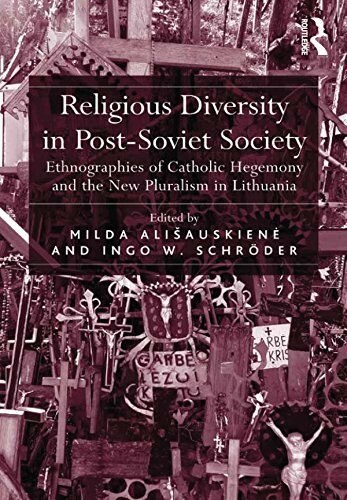 All in all, Milda Alisauskiene gives a very interesting overview of religion in Lithuania with a glimpse of what religious life looked like under Soviet Union rule. Despite the persecution faced by clergy, limited resources and educational training for new clergy, as well as limitations on public displays of religion, many believers remained faithful. Religion still unites the people and continues to serve as a crucial institution in conceptions of Lithuanian cultural identity.